Find how a Magnetic Flow Meter.works on this link. 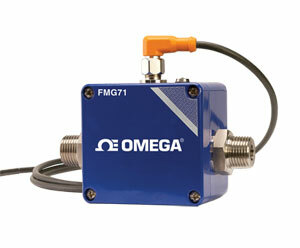 The magnetic flow meter of the FMG70 series from OMEGA allows a unique and highly reliable measuring technique to be introduced into areas of process control previously considered not possible. Changes of temperature, density, viscosity, concentration or electrical conductivity (minimum conductivity of 50 µS/cm) of the fluid do not affect the output signal. FMG70 series can be used in areas where flow sensors with moving parts eg. paddle wheel sensors, cannot be applied due to contamination or particulates in the media. The sensor is intended for continuous measurement of flow rates or for dosing and batching. The output signal frequency (or current) is proportional to the flow.